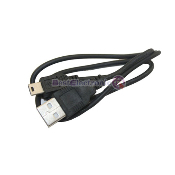 Our Products >> USB CL075 2.0 A to Mini B 5-PIN Cable MP3 MP4 Camera New. USB CL075 2.0 A to Mini B 5-PIN Cable MP3 MP4 Camera New. USB 2.0 A to Mini B 5-PIN Cable MP3 MP4 Cameras. Length: 50CM or 20" Color: Black. CL075, S4038.